She will receive a cash prize and entry in the bi-national competition with winners from other Mennonite-related colleges and universities in the United States and Canada. 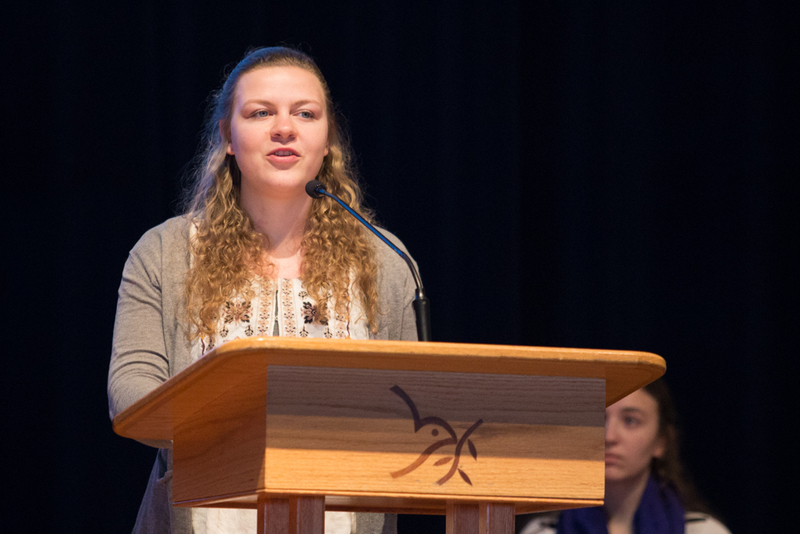 The annual contest, established in 1974 by the directors of the C. Henry Smith Trust, offers students an opportunity to discuss the application of the Christian peace position to contemporary concerns in an 8-10-minute speech. 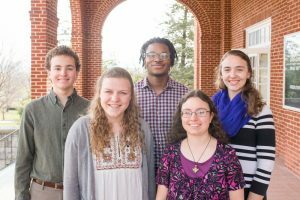 From left: Jacob Myers, Sylvia Mast, DeVantae Dews, Lydia Haggard, and Cassidy Bontrager. Judges of the contest were Phil Kniss, senior pastor of Park View Mennonite Church; Ervin Stutzman, former executive director of Mennonite Church USA and former dean of Eastern Mennonite Seminary; and Amy Knorr, peacebuilding practice director at EMU’s Center for Justice and Peacebuilding. The intercollegiate competition is administered by the Peace and Justice Ministries of Mennonite Central Committee (MCC). C. Henry Smith was an American Mennonite historian and professor at Mennonite colleges and the University of Chicago. He taught history for nearly 50 years at the collegiate level, and was well-known for his numerous books on Mennonite history and his particular attention to the peace commitments of the Mennonite tradition. Eastern Mennonite University has participated in the event since 2003, with the exception of 2015. EMU students have won the grand prize at the bi-national level in 2003, 2004, 2007, 2009 and 2011. The contest is sponsored by EMU Bible and religion, language and literature, and peacebuilding and development programs.